The creation of an immersive virtual setting requires students to understand the immersive visual and audio environment of the world they intend their characters to inhabit. Development of a digital story arc requires an understanding of sequence, causality, and communication of meaning to digital story viewers. An immersive digital story can be created and viewed on mobile devices, tablets, and computers by students as early as elementary school. Virtual Digital Storytelling sits at the convergence point of empathy, social and emotional learning, engagement with community, and learning with emerging technologies. 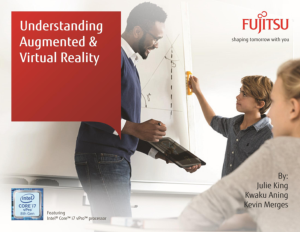 Download today to find out how Fujitsu's suit of Augmented and Virtual Reality tools can help your business.